I was not looking forward to spring break. Not even a little bit. In fact, I watched the days tick down on the calendar with a sense of doom. Alice was only a month old and we hadn’t yet found our “groove”. Spring break meant throwing both boys into the mix. I wasn’t too worried about Eddie, but Charlie is sort of a live wire. He likes to do what he wants to do how he wants to do it when he wants to do it…usually when my hands are full of baby. Therefore I planned to have Charlie in daycare three of the six week days. I know, I’m a wimp. The other days I quickly realized he (and Eddie, really) needs direction with what to do and since the weather was cold and rainy all week, “what to do” had to be indoor activities. We played with play dough and did water paints and coloring books. We cleaned up the playroom and ate lots of cheese sandwiches (Charlie’s favorite lunch). And we did it to music! This is where I admit that despite my music snobbery, our family is crazy for Kidz Bop. We have Kidz Bop 24, 25, 27, and now 28. Seriously, my younger self would be shocked to learn that when I hit my mid-30’s, I would be Ok with (fine, I would even LIKE) to sing Shake it Off at the top of my lungs with the Kidz Bop group. Here is the thing: I’m really not a giant fan of pop music, but Kidz Bop tends to choose the few songs I do like..or at least the songs that are serious ear worms. For instance, we found ourselves jamming to lyrically appropriate (if not hilarious to those of us who know the real lyrics) versions of Fancy, Shake it Off, and All About that Base on Kidz Bop 27. My boys’ favorite song on KB 28 is Uptown Funk which they call Hot Pants. If you know the song, you can probably figure out where they got that from. We mostly listen to our Kidz Bop CDs in the car. Over spring break, Eddie and I went to see a movie together, and we had about a 30-minute drive to get to the theater. You better believe we were jamming out to some Steal My Girl and Lips are Movin’. 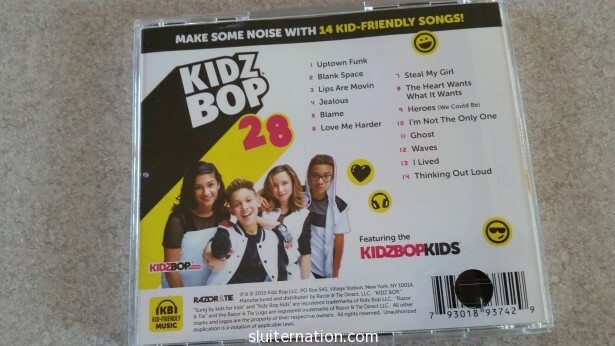 And while I would ALWAYS rather be listening to the Pearl Jam channel on satellite radio, I would much rather have the kids request a Kidz Bop album than something with Wheels on the Bus on it. So Spring Break was still a challenge since I’m not used to three kids just yet, but we at least had fun and danced our way through it. Disclaimer: This is not a sponsored post. 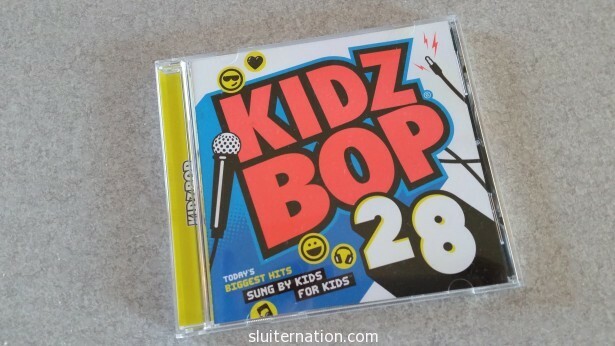 Kidz Bop sends me CDs and the boys and I listen to them. All opinions are our own. How does it make you a wimp to have him in daycare?! I keep my kids in frequently–I pay for it! They love it! It helps everyone to keep up their routine. On a week vacation, I tend to keep them home on Friday, and on Christmas, maybe 3-4 days. But in general, I don’t mess with their schedules lol. It’s smart, not wimpy. I’m in 100% agreement. When my kids were little, I’d much rather listen to “kid friendly” versions of the music I liked, vs. kid songs. My youngest’s pre-school teacher pulled me aside and said that she loved my son had announced that Rob Thomas was his favorite singer (all the other kids were naming a local “kids entertainer). Glad to hear you reigned in Spring Break!